Of the many traditions and ceremonies associated with Freemasonry, most of them use unique objects which are bestowed with symbolic meaning by the Brotherhood. 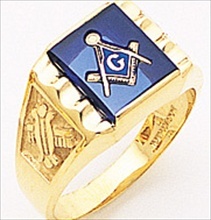 Masonic rings are very symbolic objects and perhaps the most common outward sign that its bearer is of The Craft. While most are worn on the right hand, previously Masonic rings were worn in secret, hiding the wearer’s identity from the public to protect their associations from detection. Historically speaking, a Freemason could be executed if he allowed his identity to be revealed.There are several styles of Masonic rings, most of which carry a crest or image which incorporates the square and compass motif. The square and compass designates common knowledge which is shared by Freemasons and is regarded as an Oath towards living a life of virtue and righteousness. Points Up or Down on the Compass? What is the proper way to wear a Masonic Ring? Should the points of the compass be toward or away from the body? There are many opinions on this subject. To the best of my knowledge the Grand Lodges have not made any regulation on this subject. Another opinion is that “When the emblem of the square and compasses is displayed on a building, pennant, button, watch charm etc., universal custom requires the points of the compass point downward. When displayed on the Altar they point away from the Master. As the Master from his station views the compass from the Altar of his lodge, the points are from, not towards him. As the wearer of a compass watch charm views it, the points are down and away from his eyes. In a similar way as he views the emblem on his ring the points should be down or away from his eyes. The square is the symbol of earthly, the compass of heavenly perfection. As a combined emblem the ends of the square point up as a symbol of man’s aspirations toward God; the points of the compass are down to represent heavenly qualities coming down from God to earth. Therefore it would seem that the proper way to wear a ring would be that is which its symbolism is best expressed; namely, that in which, when the hand is held in its usual position the points of the compass are towards the earth and away from the wearer’s eyes. An implement of Operative Masonry, which has been adopted by Speculative Freemasons as the peculiar working-tool of the Master’s Degree. By this implement, and its use in Operative Masonry to spread the cement which binds all the parts of the building into one common mass, we are taught to spread the cement of affection and kindness, which unites all the members of the Masonic family, wheresoever dispersed over the globe, into one companionship of Brotherly Love and an old custom in an Oxford Lodge, England, gave it prominence as a jewel, and as a symbol it goes back to the practice of the Ancient. Essentially the Masonic Apron is the badge of honorable labor. The right to wear it is given only the most honorable of tried and trusted men. Much has been written on these meanings of the symbol. As the apron of all sorts, sizes and colors was an article of sacred investure in many of these, so is it in ours. What is truly important is the apron itself; what is less important is its size and shape, its method of wearing. 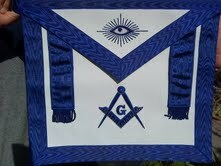 Material and color are symbolic, but a Freemasons may be – and has been many – “properly clothed” with a handkerchief tucked about his middle, and it is common practice to make presentation aprons, most elaborately designed and embellished, without using leather at all, let alone lambskin. An example of the Masonic Apron can be found at Fox Jewelry. No individual can speak for Freemasonry, an individual may only express a personal view which may, or may not, be shared by other Freemasons. In many countries the Letter ‘G’ is taken to mean God, the Supreme Being, and whilst it is an interpretation held by many Freemasons it is not a universal view. An example of this can be found on the Masonic Ring worn by a Master Mason. At one time, when very few were could read, the use of symbolism was widespread. It was a form of visual shorthand. Symbols were easily recognized, and understood, but as literacy increased the need for symbolism declined. In centuries past, symbols, especially religious symbols, were common throughout Christendom. The Compass and Square, the symbol of the 3rd degree Master Mason is found on the Masonic Rings found at Fox Jewelry. You are currently browsing the archives for the Masonic Symbolism category.